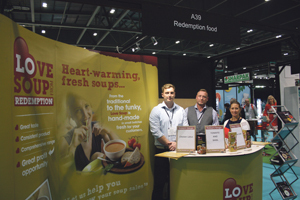 Redemption Foods was first set up in 2004 by a talented group of multi-skilled food service supplier professionals, specialising in providing great tasting and nutritious soups of all types and flavours. The company is based in County Durham and distributes far and wide across the whole of the UK. Redemption’s Soups can be found everywhere from delis to farm shops, sandwich bars, coffee shops, universities and campuses, golf clubs and more. The food provider has been growing year upon year with consistent sales and an ever improving service. 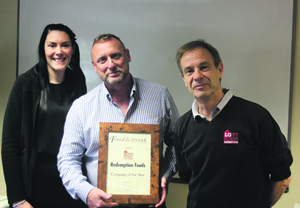 In the last twelve months alone, Redemption Foods have seen an impressive organic growth of approx. 15 %. The majority of soup providers see a boost during the colder months and a significant slump during the spring and winter. However Redemption Foods have experienced a steadily increasing interest, with a rise in sale numbers during even the mildest of winters. Redemption Foods has a large variety of soups, boasting dozens upon dozens of different flavours. In addition, they also provide delicious stews, newly launched fruit toppers and even bespoke sauces for chefs. All of Redemption Foods’ ingredients are as fresh and locally sourced as possible. They also cook their soups according to the optimum batch size to ensure great tasting soup every time, regardless of cost or time consumption. Within their soup specialism, there are Simple soups, House soups, Special soups, Extra special soups and Retail soups to choose from. The simple soups are traditional, delicious and loved the world over. It includes the Burns Broth which is packed with nutritious wholesome vegetables and pearl barley for a warming and hearty taste. The Carrot, Ginger and Lime soup is a particular favourite amongst customers, having a creamy texture that mixes carrot and coconut milk with the fresh zingy taste of ginger and lime. Another Simple Soup not to be missed is the Tango Tomato and Coriander soup which is lightly spiced for a flavourful taste, with a sweet aftertaste courtesy of the expertly added coriander. The House soups are a staple commonly found on menus around the country. It includes the Minted Garden Pea soup, the Lentil and Bacon soup and the Chunky Vegetable and Red Lentil soup. Popular amongst soup lovers is the Sambar Dahl, an authentic Indian inspired soup that blends tamarinds, red lentils, fenugreek and just the right amount of spices. Their Special soups are a guaranteed hit for customers, offering a wide range of mouth-watering soups that are bursting with flavour. The Boston Chicken Chowder is both thick and creamy and made with white wine and herbs. It also features large pieces of chicken, sweetcorn and potato. The Mexican Chilli Chicken soup is a succulent dish that brings together flavourful chicken, red kidney beans, zesty lime and spices. It’s the perfect bowl for cold days that both excites the mouth and warms the insides. 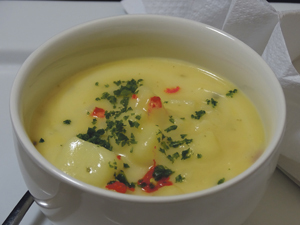 Redemption Foods’ Extra Special Soups are highly renowned and hotly sought after. They include innovative soups such as the Creole Chicken Gumbo soup, the Indonesian Chicken Noodle Broth and the acclaimed Thai Green Lentil with Coconut, Spring Onion and Spinach soup. This delectable soup is the ultimate blend of flavours, infusing coconut, lentils, spinach, spring onions, lemon grass, red chilli and more to create a scintillating concoction. Redemption Foods are committed to producing the highest quality handmade soups on the market and are eager to take on client requests to make new and unique bespoke recipes. They are also ever investing in their staff and infrastructure, and have recently added another Local Chef, Mr. Andrew Tranter, to their team as Head of Food Production. Crow added, “At Redemption Foods we take customer feedback very seriously and have recently changed our packaging to suit the needs of our clients. Our standard round packaging has evolved into a new environmentally friendly square shape which allows for easier storage space.” To ensure food safety, Redemption Foods supply their soups in 4kg foodservice buckets, their stews in 2kg pouches and their fruit toppers in 1kg food service buckets too. The buckets feature tamper proof lids and are made of a sturdy plastic that reduces breakages. In addition, they are re-sealable and easily stackable to take up less space. 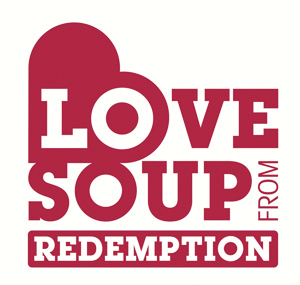 If you would like to get your hands around a bowl of Redemption Foods’ soups, you can find them in shops and chains all around the country. Don’t forget to get in contact or visit the website if you would like more information on their many food services. This entry was posted in Company of the Year, Featured and tagged Soup. Bookmark the permalink.